The Rue Saint-Denis in Montreal, Quebec in Canada is a fabulous place during the day where cafes, restaurants, bookstores and specialty shops line the street. When darkness encompasses the area, the street is illuminated and the restaurants, pubs and clubs are filled with people who enjoy the night entertainment along this historic street in Montreal, Quebec. 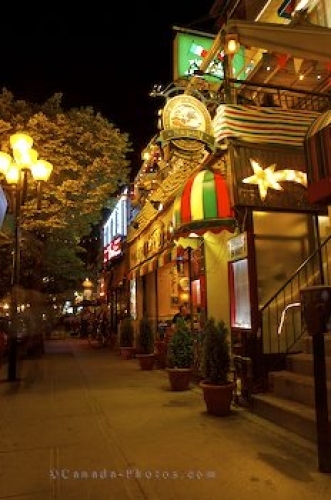 Nightlife and Restaurants lining Rue Saint Denis, Montreal, Quebec, Canada. Picture of the night entertainment locations along a historic street in Montreal, Quebec.